The sixth Carlisle festival enjoyed the customary large turnout for two and a half days of top class entertainment. 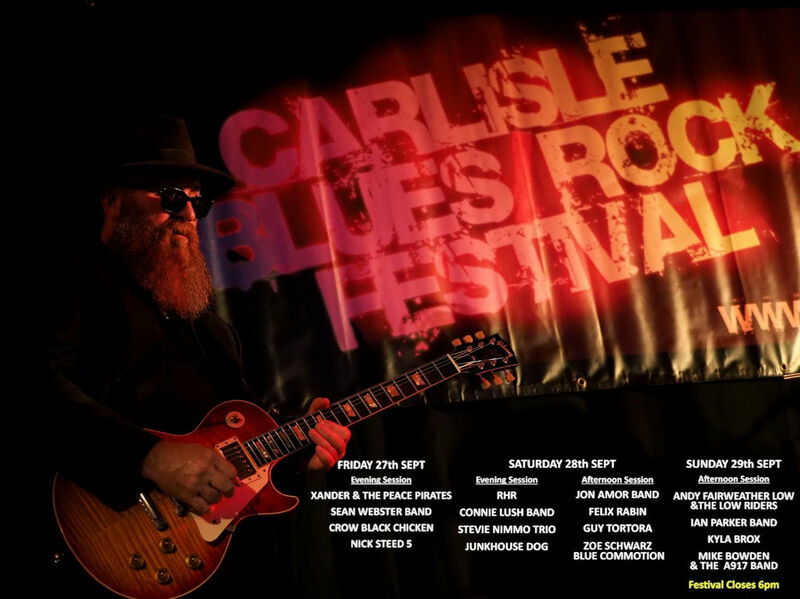 As in previous years, the line-up covered an extensive range of blues-related music incorporating artistes from around the UK and special guests from the USA and Australia. The festivities got off to a flying start with a highly energetic set from Scotland’s Gerry Jablonski and The Electric Band, with Gerry moving effortlessly between frantic and manic and harp player, Peter Narojczyk, doing a fair impression of David Walliams on a pogo stick as he bounced on the spot. Northern Ireland’s Grainne Duffy then eased the pace with a soulful set that showcased her attractively raw-edged vocals, expertly backed by her excellent band. Carlisle Festival’s favourite son, Ian Siegal, accompanied by the marvellous Mississippi Mudbloods (Luther Dickinson on guitar, Cody Dickinson on drums and Welshman Carwyn Ellis on bass guitar) headlined the session with a stunning performance that brought the house down. The entertainment continued in the bar from midnight in the safe hands of The Groove-A Matics, fronted by the richly talented Mick Cantwell on vocals, sax and harp and the widely popular Johnnie Whitehill on guitar. Steve ‘Pablo’ Jones showed that his talents go beyond his skill as an artist, delivering an impressive acoustic set of his own compositions to set the scene on Saturday afternoon. He was followed by Cherry Mee Lewis, whose bubbly personality was infectious as she raced through a varied programme admirably supported by her band. Australian Geoff Achison and his UK Souldiggers then took everyone’s breath away with a high-powered, funky set, Geoff’s rasping vocals and blistering guitar work gloriously underpinned by Paul Jobson (keys), Sam Kelly (drums) and Spy Austin (bass guitar). The Paul Cox Band headlined the afternoon session, Paul’s wonderful vocals and the consummate skills of Roger Cotton (keys) and Mike Summerland (guitar), gliding through a highly professional, enthusiastically-received programme. The Mick Ralphs Blues Band opened the evening session, with the founder member of Mott The Hoople and Bad Company cranking up the volume on a slightly rusty but high-powered set. Martin Turner’s Wishbone Ash proved to be an inspirational choice. The iconic main man, on lead vocals and bass guitar, backed by a hugely talented band comprising guitarists Ray Hatfield and Danny Wilson and drummer Dave Wagstaffe, went down a storm. Larry McCray and his band headlined the day with a brilliant, top-of-the-bill performance. Larry’s silky vocals and superlative guitar playing were supplemented by a superb rhythm section to provide a marvellous conclusion to another memorable day of music on the main stage. Tommy Allen (on guitar and percussion) and Jonny Hewitt (on harmonica) provided the bar-based extracurricular session with a splendid set of original compositions and well-loved standards. Mike Bowden and John Williamson were the perfect act to start the final day, combining the powerful, gravelly vocals of Bowden with the polished guitar playing of Williamson, overlaid with the former’s self-deprecating humour and backed by Big Vern on percussion. In complete contrast, the Jon Amor Blues Group blew any remaining cobwebs away with a rousing set of blues-rock. Jon’s vocals and exceptional guitar work were expertly backed by his impressive young band. Lisa Mills then took to the stage, exuding consummate stage presence and artistry. Her fabulous vocals and lovely guitar work, supported by long-time associate Ian Jennings on double bass, had the appreciative audience completely enthralled. The headline act on Sunday was Andy Fairweather Low & The Lowriders, who brought the festival to its close with a highly entertaining set that provided a whistle-stop tour of Andy’s career. The wide ranging set list covered music by The Beatles, The Shadows, Jimmy Reed, Tampa Red and Freddie King and, unsurprisingly, three of Andy’s hits. With five very successful festivals already in the bag, organiser Nick Westgarth had his work cut out to maintain the enviable standard. It is very much to his credit and that of his army of assistants, including MC Mark Singleton, that they once again came up trumps with what was arguably their best event yet. No pressure for next year then!